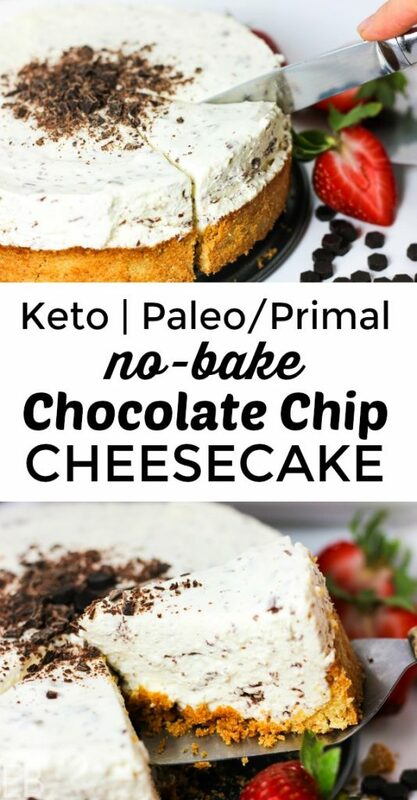 Keto No-Bake Chocolate Chip Cheesecake is also Paleo/Primal. The shaved chocolate provides the perfect subtle crunch and extra chocolate flavor. 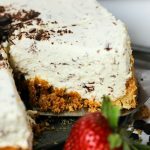 The creamy filling: I can’t wait to tell you all about it… You’ll love this No-Bake recipe and how beautifully it comes together! Ever so creamy, light, billowy-pillowy, soft and PERFECT, like a dream, but still rich and delicious, without being dense because: that little bit of gelatin and freshly whipped cream! So gelatin’s the first trick for the amazing pleasure-texture of this cheesecake filling. Second key? The whipped cream! 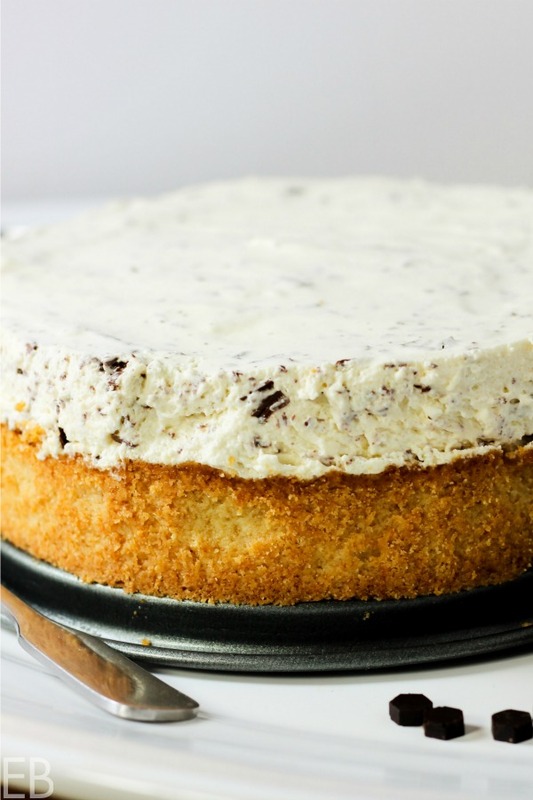 Oh my, it’s SO good: It’s folded into the whipped cream cheese/chèvre mixture, and you’ll not want to wait for it to chill when you see this dairy marriage. Finally, cream cheese or chèvre: You get to choose. I LOVE the French chèvre that Trader Joe’s sells, so that’s what I make it with for our family. And chèvre is more allergy-friendly too. But if you prefer cream cheese, that’ll work great. Oh, and the chocolate! — I used my favorite presentation of it, and that’s shaved. Going WAY back to my childhood when some ice cream shops used big chips and others shaved their chocolate, in Mint Chocolate Chip Ice Cream, I am a shaved girl all the way. Shaving chocolate allows it to crackle-smash in your mouth, instead of getting in your teeth. It also heightens the chocolate-availability, which is a thing: More surface area is exposed; thus you get more chocolate flavor. Personally, I like the way shaved chocolate compliments the soft texture of this cheesecake. And it’s pretty, and dainty, with a bold punch. Shaving chocolate also allows us to choose the chocolate bar that’s right for our Keto or Paleo lifestyle! I give a couple of options in the recipe and Recipe Notes below, both of which I like. Lastly, if you like, I give a link below to my own homemade chocolate chips. They’re lovely because you get to choose your sweetener. 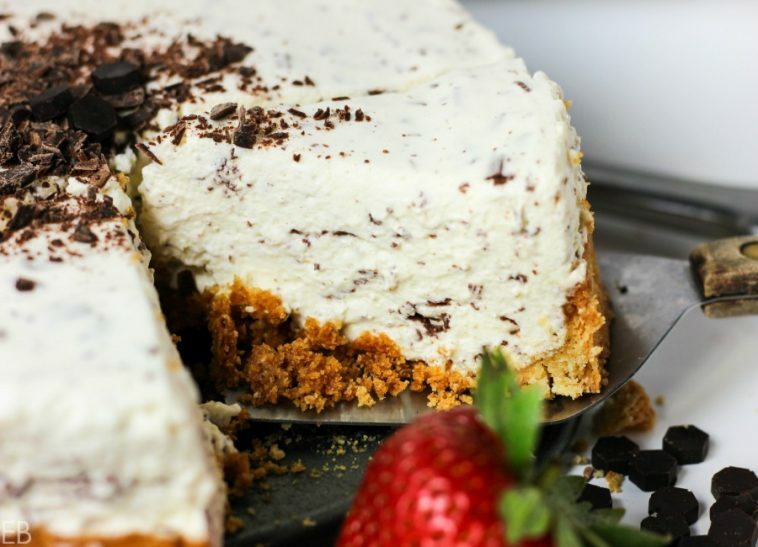 They make a great garnish for this cheesecake, or you can use them in the filling. How to shave chocolate? Just use a veggie peeler, shaving toward yourself; or a sharp knife, cutting down toward your cutting board, like you’re slicing cheddar cheese, but really thinly. Both work great; you’ll see. After many years of healing (6+ years on the GAPS Diet!) I don’t have much of a sweet tooth anymore (AMEN!). But I do love creamy dairy; and I do love fat. So for me, with this dessert, I just use stevia to sweeten the filling. I believe most palates will like it a little sweeter than I do; and so the recipe includes the option of adding additional sweetener, both a Keto option and a Paleo option. The crust also includes these sweetener options: You can choose between your preferred Keto sweetener (find Monk Fruit Sweetener here) or Paleo (find my favorite maple sugar here). I am super pleased about this crust! It has only 3 ingredients and it’s fabulous and flaky! You’ll love how fast it mixes up, bakes and is ready to fill. Just 7 minutes in the oven!! So it won’t heat up your house during hotter months, and it makes this whole recipe no-fuss-fast. I guess I should say, this is the only part of the recipe that does bake; but you’ll hardly notice. 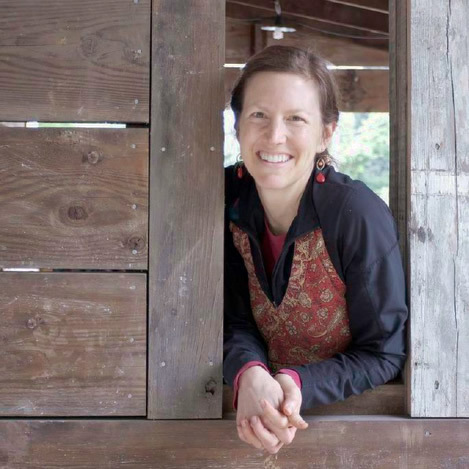 If you choose to make your crust from sprouted nuts for better digestion (good for you! 😉 find the how-to here and below in Recipe Notes), then the best Keto nuts to choose from (meaning low-carb) are macadamia nuts and pecans. Both make a lovely crust. 9 ounces chevre or room temp. cream cheese find French chevre if you can (available at Trader Joe's); it's the best! Mix together crust ingredients well. Press into cheesecake pan, and up the sides about 1 inch. Bake about 7 minutes, until golden brown. Remove from oven and place in fridge while you prepare the filling. In large metal bowl with beaters, whip the cream until stiff peaks form. Set aside. Place water in small saucepan. Sprinkle gelatin over its surface. Allow to bloom, stirring in with a fork. Heat over medium heat, stirring constantly, until gelatin dissolves and is foamy on the top, about 1 minute. Set aside. In another large metal bowl with same beaters (no need to clean them after whipping the cream), place chevre or room temperature cream cheese. Beat on high for 30 seconds until lighter and looser. Add stevia, optional additional sweetener and vanilla. Beat. While beating, drizzle in gelatin water and mix well. Fold in whipped cream thoroughly. Add shaved chocolate and fold again. Pour filling into crust and smooth top surface. Refrigerate 4-6 hours. Find Monk Fruit Sweetener (for Keto/low-carb) here. Find (for Paleo/Primal version) maple sugar here. Find Vanilla Bean Powder here. Please always buy Fair Trade chocolate! 🙂 Here's a great Fair Trade Certified, Unsweetened Chocolate Bar! By shaving this bar, you get great chocolate flavor without any sweetener! Find my homemade chocolate chips here. This recipe allows you to use any sweetener you prefer. If you love no-bake cheesecakes as much as I do, you’ll also love these: Peppermint, Eggnog, Saffron-Vanilla, and dairy-free, probiotic Fermented! This is so lovely and enticing! And I think I could even make this! Thank you, Mimi! Yes, it’s definitely a straightforward and easy recipe to make! I hope you do it and love it. super excited to try this! I adore chevre, and so do all my kids! Awesome addition! This seriously sounds heavenly! You are so creative with your keto recipes. I’m all about almond flour these days! Love your crust to cheesecake ratio, so yum!! Yes please!!! The way you described it – billowy pillowy – made me smile so big. I can just imagine the texture and how perfect it is. This is such a fun flavor too and I love that it works for so many different diets! Oh gosh my mouth is watering! I can’t believe this is no-bake – way easier than I thought! It will be over 90 here this week so there is no way I’m baking! Oh, keep cool, Renee!! Maybe you’ll get to go to that big beautiful lake of yours to help stay cool! This looks amazing! My family would absolutely love this cheesecake. I’m such a sucker for anything choc chip…choc chip ice cream is still my fave. So I know I will LOVE this cake! Looks incredible! This cheesecake is calling to me! Not only does it look super delicious, but minimal oven time during the summer is key! Can’t wait to try it. This is totally genius ! So yummy ! Definitely calling my name!! Love all the variations possible. Chevre!!! yes please! This looks so very rich and ahhhmazing!! I am loving your ingredients too! This is heavenly! Chevre! Mind blown, can’t wait to try this for all my keto friends. Aw, that makes me happy; yay!! ENJOY! Yes, chèvre is definitely one of life’s great pleasures, for sure, and eaten this way it is just pure swoon-yummy! Looks delicious! You never mentioned how big your cheesecake pan is. Was it a 7 inch one? My bad, yes! I used the small 7″. That size creates the taller cheesecake.